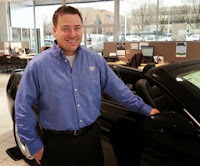 Quinn Mihalski, a Man for All Season at Heiser Chevrolet! One of the things that make a company a great place to visit is its people.+Heiser Chevroletis thrilled to have a Service Manager that goes above and beyond expectations.Quinn Mihalski earns respect by exhibiting a passion for what he does, day in and day out, no matter the season. We brought in our 2010 Equinox for a major repair that happened just after the extended warranty expired. The Service Manager Quinn Mihalski contacted GM for us and negotiated a reduced price for the work that needed to be done, and got the part installed the same day!Quinn was very accommodating and friendly.Now, I’m confident my vehicle is always going to be maintained well when I have it serviced at Heiser. Thank you for being so understanding Quinn! During Heiser’s Final 2013 Blowout we need to move out some vehicles! So, put ZERO DOWN and lease a new 2013 Prius Sedan Two for just $242 a month for 36 months.Or, ZERO OUT-OF-POCKET gets you a new 2013 Camry LE, leasing for just $235 a month for 36 months!Purchase and get big rebates or 0% APR financing during Heiser Toyota’s Final 2013 Blowout.Find us off Highway 45 at Good Hope. +Heiser Ford Lincoln will once again prove that ‘Anything’s Possible’ by sponsoring a special day with all test-drives earning a donation to a local charity.The “Drive 4 UR Community” will run November 2, 2013 from 10 a.m. to 4 p.m. at the dealership and benefit Autism Speaks.This marks the 4th year of a successful association between the charity and the Glendale automobile group. Heiser Ford Lincoln will collect funds for Autism Speaks +Autism Speaks for every valid Ford test-drive completed on this first Saturday in November.Each test-drive will earn $20, up to a total of $6,000.Those in the market for a new vehicle can easily participate and help benefit a worthwhile cause at the same time. +Ford Motor Company acknowledges it takes a lot of dedication to make a difference in the community. In a world where one car dealer seems just like the next...comes +Heiser Ford Lincoln ! Get an UNBELIEVEABLE and UNBEATABLE deal at Milwaukee's Best Domestic Auto Dealership! Like a lease on a 2014 +ford focus for just $159 a month for 24 months!See why Heiser is Wisconsin's Fastest Growing Ford store...where you can lease a 2014 Ford Escape for just $199 a month for 24 months.Everyone's talking about Heiser!Visit today and SAVE BIG on a remaining 2013:Just 2 blocks west of Bayshore Mall on Silver Spring. Heiser Chevrolet of West Allis & Heiser Chevrolet Cadillac of West Bend to offer great deals on their remaining 2013 inventory. It's the Final 2013 Blowout at Heiser Chevrolet!That means you'll get the best deals right now on our great selection of remaining vehicles! Imagine a new 2013 Silverado with up to $9,000 off! Or choose a new 2013 Equinox with a $189 a month lease payment. We even have the hard-to-find new 2013 Malibu, leasing for just $159 a month. 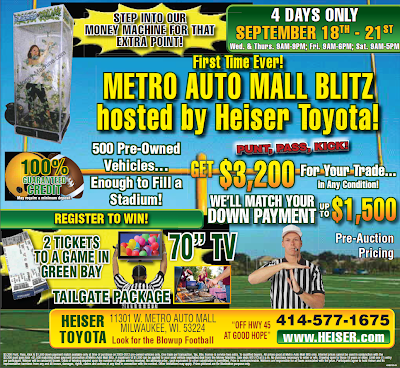 Don't miss the biggest savings of the year, during the Final 2013 Blowout.Hurry to Heiser Chevrolet in West Allis or West Bend today. West Allis- between Lincoln & National; West Bend-On Hwy. 33. 2013 SILVERADO 4x4Disclaimer:$9,000 on 2013 reg. cab totals customer cash and loyalty plus package and dealer discounts. Tax, title, and license extra.Expires 10/31/2013.Manufacturer's Suggested Retail Price maynot represent actual sale price.Best per Shepherd Express.